They say you have to start somewhere. For Patricia Whitely, the University of Miami’s vice president for student affairs for the past two decades, that meant seven years of scooping ice cream in order to pay for college. Whitely worked her way through St. John’s University in her home state of New York. Whitely, who described herself as “self-made,” obtained her bachelor’s degree in management and theology and then her master’s in Student Personnel Services from the University of South Carolina. It was right after graduate school, in 1982, that Whitely was hired as a residence coordinator. After being promoted to assistant director of residential halls, associate director of residential halls and director of student life, Whitely was chosen in 1997 to serve as the university’s second vice president for student affairs. Whitely, who was only in her 20s when she started at the university, said it has been the campus diversity, the student body and the constant momentum of campus that has kept her invested in her work at UM. “I just thought that we were continuing to do cool things, and so there were challenges, and I decided that as long as there were challenges and I felt I could make a difference, that I could make an impact, that it would be a good place for me,” she said. In her role as the university’s vice president for student affairs, Whitely is responsible for overseeing all matters regarding students, including their assimilation into the university’s environment and their wellbeing. At times, Whitely has been at the head of managing crises, including student deaths, which she called the “hardest part” of her job. For junior Rick Lin, Whitely exemplified ultimate dedication to the wellbeing of students. Lin began his spring 2017 semester late after his twin brother, UM student David Lin, died in January 2017, following a battle with leukemia. Rick Lin, president of the Council of International Students and Organizations (COISO) said he received a text message from Whitely when he arrived back on campus, asking him if he needed anything. For Whitely, being responsible for a population of more than 16,000 students is a never-ending job, and she’s always running around campus with a jam-packed schedule. In order to maintain the level of efficiency needed to perform her daily tasks, Whitely darts around campus, often avoiding the pleasantries and skipping straight to a warm “What can I do for you?” When she’s not answering emails on the go, she’s in meetings with student organization leaders and administrators or giving interviews. Even on Sundays, Whitely is working. Whitely’s administrative assistant, Nicole Sanchez, said students might be surprised at how much time Whitely spends working. “I have never encountered or met anyone more committed to their work than Dr. Whitely. Whether it’s a Sunday, a vacation, late at night when she should be sleeping or she is 50,000 feet in the air on a plane, she is always present in her role as VP for Student Affairs,” Sanchez said in an email. Whitely said maintaining that level of work for over 20 years has been a balancing act. Part of that balance is at home, and Whitely has credited her husband, George, for allowing her “to perform at a very high level” because of the way he helps her in their “bit of nontraditional situation.” In their 22-year marriage, Whitely’s husband has served as homemaker and caretaker for their teenage daughter, allowing Whitely to focus on the needs of the student body. Whitely said health and fitness also play an important part in keeping her vibrant and on her feet during long work days. 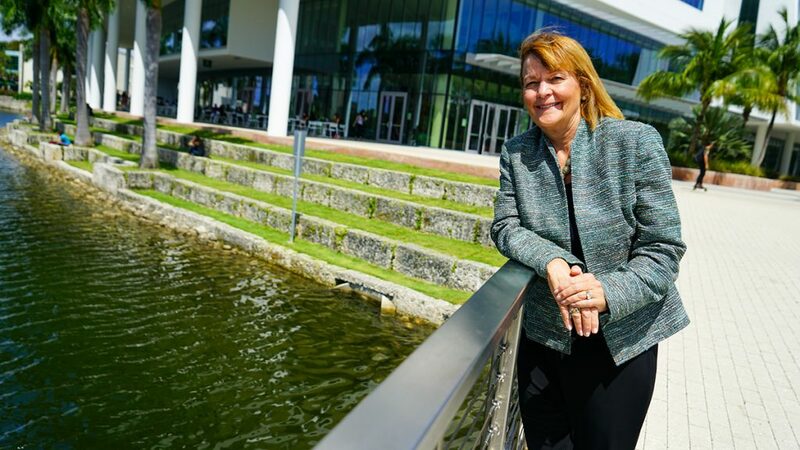 Whitely’s dedication to UM includes working as a liaison between the student body and President Julio Frenk, the third university president that she has served. Her work has not gone unnoticed by top administrators. Whitely has been recognized on a local and national level for her work as student affairs vice president. Among some of the honors she has obtained is the Scott Goodnight Award, one of the most coveted awards in higher education that recognizes professional and innovative achievements in response to students’ needs. On April 3, Whitely was awarded the James L. McLamore Outstanding Service Award, an award given by faculty that recognizes service “above and beyond the call of duty.” Whitely said the more meaningful awards in her collection are ones that come from faculty and students, including the McLamore award and Student Government’s Unsung Hero Award. Outgoing Student Government President Vikesh Patel, who worked with Whitely throughout his presidency, said one of the reasons Whitely is an ideal advocate for students is because she is passionate about her work and cares about the students. Patel recalled when, during Hurricane Matthew in fall 2016, Whitely spent 13 hours on campus with the Student Government Executive Board visiting students at the residential colleges and dining halls. For Whitely, being in charge of one of the nation’s most diverse student bodies for two decades keeps her driven. In fall 2016, UM’s incoming freshman class was composed of 50 percent ethnic minorities, according to university data. Whitely said each year, with each incoming class of young people beginning new careers, she strives to do better than she did the previous year. Correction, 1:37 p.m., May 1, 2017: A previous version of this story stated that Julio Frenk was the fourth president inaugurated under Patricia Whitely’s tenure, which is incorrect. Julio Frenk is the second president inaugurated under Whitely’s tenure and the third president Whitely has served. Correction, April 27, 2017: The cutline of the feature photo originally stated that Whitely was in her 15th year as vice president for Student Affairs, which is incorrect. She is in her 20th year. Additionally, this article originally stated that Whitely got her bachelor’s degree in business management and theory, according to her biography on the Division of Student Affairs website, which was incorrect. Whitely earned a bachelor’s degree in management and theology.